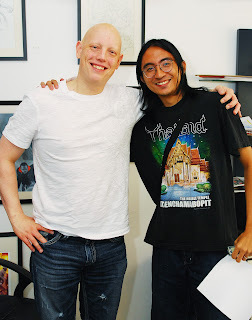 After the roundtable interview we conducted with David Finch at Fully Booked, I had the opportunity to speak to him individually. 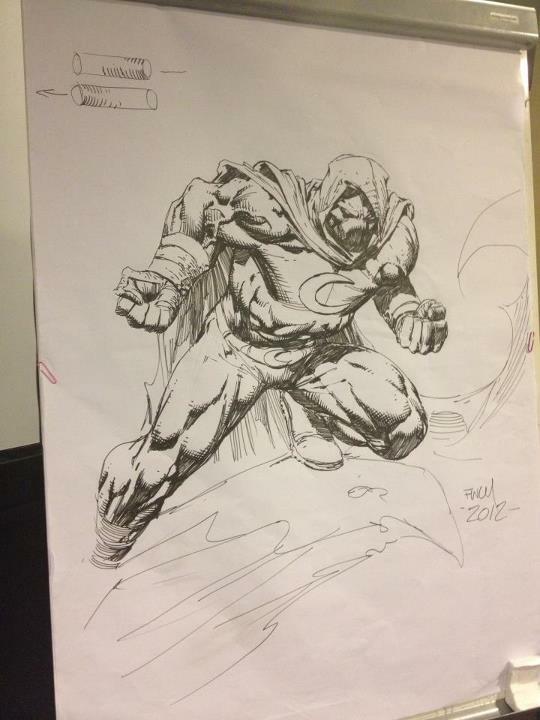 Afterward, I went to his talk, where he drew Batman and Catwoman in front of an audience of over 100 people. The following is a consolidation of the questions I asked in both settings (individually and in front of the audience). I'm doing this partly for convenience and partly so I can pepper you with pictures of how his drawing progressed. It's actually amazing how much form it took the moment he started rendering. I've already asked you most of the questions I was going to ask about the industry and about the creative process. So I'll ask, why Batman? Batman is such a great visual character. I love the shadows and I love the city. It's such a dark city and I can be really creative with it. Because it's not a real existing city, I can draw buildings in any kind of configuration I want and it still works. The villains are the most fun to draw in this entire business. Everybody loves the Joker, the Penguin, and even the Riddler is fun! They're all fun. Something I've always wondered... does DC have a scale model of Gotham City that you guys have to follow, or do you just make it up as you go along? It's very much made up as we go along. I think there are certain landmarks that we try to bear in mind, and lately there's been more of an effort to make things a little more cohesive. So as people are creating and drawing different landmarks and different things in the city, and also the political figures, we're putting that in a list or database for everybody to refer to to make things a little more cohesive, because it is pretty easy for things to start falling apart. Yeah, things like how far Wayne Manor is from the police station. Is there someone keeping a record of that? There really isn't. I think there's a reason. Mike Marts is a great editor, and he's really good at spotting things that are obviously going to clash with establishing the reality, but I'm not personally aware of an exact distance between anything. Because comics is a still-frame medium, there's really never even an instance — even if this were a movie, you would never actually see Batman get in the car and see the entire drive real-time anyway. So if I were to draw Batman coming out of the cave, I would draw a shot of him coming out of the cave, a shot of him driving to the city, and a drive of him at his location. That's the structure of how it would be done. That leaves it open to interpretation, but it also means that it never gets fully established. Fully Booked gave us a challenge basically to talk about Batman. And they had a list of questions related to Batman, so I'm just going to ask you those questions. Who's your favorite Batman villain? Both. Visually speaking, I think he's great. But just in general, he's crazy, which makes him so difficult to write, but when he's well-written, he's so interesting because the things he does are so off-the-wall and unpredictable that it keeps it really interesting, but he always has a point. No matter how twisted it is, it's never completely random, which I think is really interesting about the character. What's your favorite Batman story? I think BATMAN: YEAR ONE, by Frank Miller and David Mazzucchelli. It's just such a beautifully structured story. I think it's such a crime that that comic in that format wasn't used for the movie. I can't argue with Christopher Nolan, because those movies are great, but if it would have been me, I think I would have just done that. That would have been by Batman movie, YEAR ONE. You would take YEAR ONE over DARK KNIGHT RETURNS? Oh yeah. I love DARK KNIGHT RETURNS, but I think YEAR ONE is the apex of Batman. In terms of art, that's a tough question. Dave Mazzucchelli has so much going on and I love it. He's a great visual storyteller and great at arranging panels that I think is just incredible. But Frank Miller has a vicious power with his characters sometimes that I really love. I think the thing I like about art is that I don't really have to choose. I can like them all, which is really nice. How important to you is a dynamic layout over a clear one? Let's say you have three panels and one of them is coming right out at you, would you rather make it as clear as possible or as in-your-face as possible? To be totally honest with you, it really depends on the situation. There are times when the impact of that big panel is important enough that I feel like it's worth getting that in there, and I would make the other panels smaller, which would sacrifice some storytelling. And there are times that's a conscious decision. I know it's a bigger panel over more procedural storytelling. I'm willing to make that sacrifice, because I know if I were picking up a Batman comic, I'm going to flip through it and see that big picture of Batman looking pissed off and crazy, and that's what gets me excited. So I feel that to not have that there, I can't have that. At least to some degree, I'm willing to bend the rules to make that happen. But at the same time, I always try to be aware of the story. The story's really number one. It's rare that I'm in the position where I'm making that decision. There are times when I make the decisions that really affect the storytelling. That's really not intentional. Maybe I know I want to get a panel, I know I want to get something across in there, and I just don't give much thought to figuring out how to get the storytelling to work too. It's really not a conscious decision to sacrifice the storytelling, ideally. Gregg Hurwitz. The way he writes, how tight is it? Do you have to follow it or do you lay it out on your own? Well, I lay it out on my own but he writes a full-panel structured story that's pretty clear. And we also talk before I start drawing the issue, we talk through every page panel by panel. So we know what both of us are thinking. We make sure we're on the same page, so there are no real surprises. And that makes things a little stronger, because there are times — and it's happened with issue 1, there are a couple of places where what he described is really clear, but what I was thinking about doing was completely opposite from what he actually had in mind. Just a miscommunication. And me describing what I was thinking, we have a chance to say "Oh no, no." It really helps. With Gregg Hurwitz, he really has full control over the story, so my input really comes down to framing the shots and making things as dramatic as I can make them. Gregg is very good at establishing the beats in the storytelling, so I absolutely don't alter his structure. I need to know, since the Joker's your favorite villain. What's your favorite Joker story? I solicited questions from my readers, and they already asked a lot. More than one person asked this, so I'm just gonna ask you since we have the time anyway. Do you like bacon? (At this point, everyone around us laughs, and David gets this suspicious look on his face, as if he's waiting for a punchline. Then he answers slowly.) Yeeeeeesssss. Yes, I like bacon. I heard a comedian say that bacon even sounds like people cheering when it's cooking. One of the other questions that Fully Booked asked us is what kind of cake would you bake for Batman? What kind of cake would I bake for Batman? I know, I didn't answer that one either. I'm not much of a cake-baker. I think it would be awkward to present Batman with a cake. I wrote down, "Batman would not eat cake." Anyway, since you've taken on Batman at this stage, where he's not as dark as he used to be, but he's really serious, what do you think of things like the Adam West show or Brave and the Bold, you know, the lighter takes on Batman? I think there's a place for it, and there's a place for it right now. 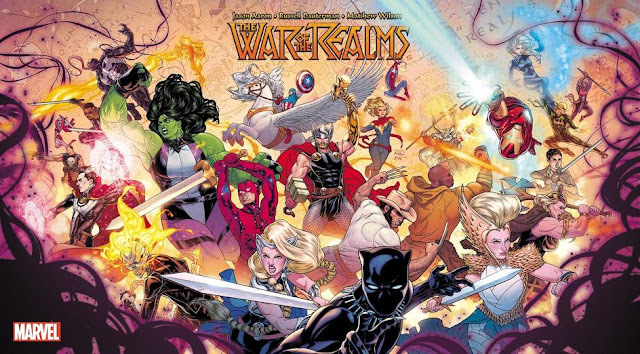 DC is still doing the younger audience comics. I think Batman is a strong enough character that he can survive the darkest, most cynical, and vicious takes, and he can withstand the lightest and goofiest take out there in the same month. He kinda embodies both of those things really, really well. And you know, I love the old cartoon. Spider-Man is a very optimistic character. He's a character that has a lot of self-doubt, but he likes to joke and cover his own insecurity with joking, so it's difficult to make a character like that too dark. I think with Spider-Man, if you want to make him dark, the best way to do that is to put him in a dark spot with villains, because his villains can be really really dark. Yeah, he can be a counterpoint to that, so you can have a dark story with Spider-Man, but Batman is a much more serious dark character. I think so much so that you can actually spoof that a little bit and that's when you get to something a little more campy, and it still works. Now, a character like Superman, he's all good, so much so that — Superman's an icon, obviously, but I don't think he has the same dimensions Batman has. He doesn't have the same internal conflict. That's the stuff that really makes Batman. Any interest in doing the lighter Batman stuff? You have a really dark style. Any interest in doing the exact opposite? No, not really. When I first decided I wanted to get into comics, it was Marc Silvestri, Jim Lee, Jae Lee, Simon Bisley... that's the stuff I really gravitated to. We were just talking about James Jean today, and I'm a huge fan of James Jean and a huge fan of a lot of the much more cartoony artists — Humberto Ramos I love — but whenever I think about the kind of work that grabs me the most, the kind of work I want to do is always something darker, so that's probably where I'm going to stay. I always want to grow and not just do the same things, but at the same time, I have to stay true to who I am. Is there an animated series from your childhood that you may have an affinity for, maybe something you'd like to do in the comics? I guess the Teenage Mutant Ninja Turtles. That would be fun. Yeah, and they're darker in the comics, so it would fit your style. Yeah. You know, now you have me seriously thinking about it. I think it's been great so far. We went out for lunch today, after that interview earlier. It was great, we had all Filipino dishes. (to Jaime Daez, the owner of Fully Booked) Where'd you take him? It was great. We had pigskin. It was great. It was really good! Oh, right, you like bacon! (laughter) It's a huge, huge city. This is my first time in the Philippines, and it's my first time in Asia, so it's really been kind of a thrill. Here's the drawing he did the second day. Admittedly, he hates drawing feet.